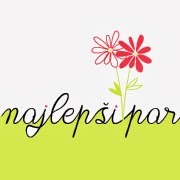 Moja druga voščilnica narejena za PTI izziv, pa tudi za Play Date Cafe barvni izziv. Okvirček sem razrezala in uporabila le spodnji zelen in zgornji modri del (oba barvna trakova sem najprej nalepila na kos belega papirja, nato pa natančno namestila šablono in okvirček izrezala). Mali metuljčki so izrezani s pomočjo Memory Box šablone. Hvala za obisk. This is so beautiful. Just love the striking simplicity of your card. sram me je, a če ne bi napisala, bi nemara ne opazila, da sta dve barvi zelena/modra. Mi je pa všeč celotna kombinacija. Zanimiva kombinacija in luštni metuljčki! This is so pretty and I love the glittered buttons. Your sweet butterflies are a perfect touch. Thanks so much for joining us this week at the Play Date Cafe! This is beautiful, Tina! LOVE the way you pieced that frame to represent the colors and flanked it with glittery goodness! Stunning! Thanks so much for playing along with us this week at The Play Date Cafe! This is just lovely! I LOVE how you've done the different colours at the top and the bottom, it's so very pretty! 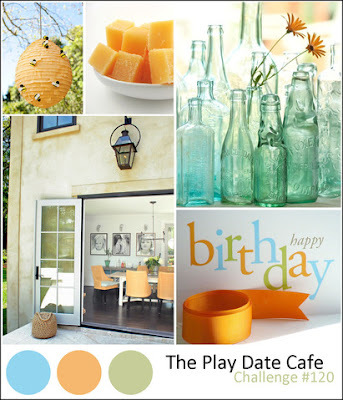 Thanks so much for joining in the fun with us over at The Play Date Cafe this week! What a great take on the color challenge, love your fluttering butterflies! So quaint!